The Trek Farley 5 is relatively basic, but it is still plenty capable, reasonably priced, and the winner of our Best Buy Award. The Trek Farley 5 is the least expensive model in this review and easily takes home our Best Buy Award. Price aside, this bike has a solid all-around performance that is as good or better than some of the other fat bikes in this review. The Farley is reasonably lightweight and is efficient on the climbs with a comfortable geometry and a short turning radius. It handles descents just about as well any fully rigid fat bike we've tried, and it has outrageous traction while climbing or descending on both snow and dirt thanks to the massive and meaty 27.5" x 4.5" Bontrager Gnarwhal tires. The component specification isn't especially impressive but it gets the job done, our biggest complaint was the saddle. If you're in the market for a capable ride to round out your bike stable or you're just looking for an affordable entry-level fat bike to get into the sport, we think the Farley 5 is a great option to consider. Trek Bikes is headquartered in Waterloo, Wisconsin, and their location in the upper mid-west means they probably know a thing or two about riding in cold and often snowy environments. They make a small line of fat bikes and the Farley 5 is their entry-level model that is offered at a very reasonable entry level price. Aside from the asking price, the Farley 5 is relatively comparable in weight, geometry, and performance to the other fully rigid fat bike models in this review. Overall, we were impressed with the Farley which is hands down the best value in our test and the winner of our Best Buy Award. Testing the Farley in some variable snow conditions above South Lake Tahoe, CA. On the descents, the Farley 5 performs a lot like you might expect for a fully rigid bike. It is most at home on smooth snow or dirt trails where its lack of suspension feels efficient and is more of a benefit than a hindrance. Despite the bike's lack of suspension, the massive air volume of the 27.5" x 4.5" Bontrager Gnarwhal tires helps to absorb a significant amount of shock and smooths over small obstacles and trail chatter, especially when you run the tires at low pressure, we liked them around 10 psi. The bike's short wheelbase and relatively short reach help to make it plenty maneuverable while the massive contact patch and grippy tread of the tires offer seemingly endless grip when cornering. While this bike isn't as long as some of its competitors it still feels comfortable and planted at speed, mostly due to the girthy rubber. Testers rode this bike on both snow and dirt and were very impressed by its surprising lack of rolling resistance and solid cornering abilities. Testing the limits of the Farley on some steep slabs and loose sand. When the going gets rough is when you begin to notice the shortcomings of the Farley 5, and all of the other fully rigid models for that matter, on the descents. You can definitely feel the feedback from larger rocks, roots, or chunky snow come straight up through the rigid fork, into the handlebar, and ultimately your hands. It's no worse than any of the other models with rigid forks, but its a far cry from the supple front end of the Kona Wozo. The 69-degree head tube angle is on the steeper side of the bikes in this test, but it feels fine on the terrain that this bike is intended for. The cockpit is relatively well equipped, although our testers generally prefer a shorter and stiffer stem and a handlebar a little wider than 750mm. That said, it worked well and provided precise enough handling. Testers would have enjoyed a quick release seat post clamp on this bike to prevent them from pulling out the multi-tool everytime they wanted to lower the saddle for an extended section of downhill riding. The front end of the Farley can feel a bit steep at times, but it handles the descents better than expected. Much like the downhill performance of the Farley, its uphill performance is strikingly similar to the other rigid models in this review. It weighs 31 lbs and 11 oz and is one of the heavier models we tested, although the differences in weight between the 5 models in this test aren't all that dramatic and we feel it's actually very respectable for an alloy framed bike with 4.5" tires. While climbing or seated pedaling on flat terrain it feels very efficient and the only wasted energy is that lost through the super wide and soft tires, although those tires do provide the best traction of the bunch. Testers were actually pleasantly surprised that there wasn't more rolling resistance while riding the Gnarwhal tires on dirt or snow, but they do feel incredibly sluggish and awkward on pavement. The rider's position while climbing is quite comfortable with a shorter 446mm reach and a slightly taller front end than some of the competition. The 74.4-degree seat tube angle puts the rider right up on top of the bottom bracket and keeps weight distributed relatively well for the purposes of climbing traction. The shorter length wheelbase and 69-degree head angle also give this bike a pretty short turning radius which helps with tight uphill switchbacks or in case you encounter some tighter more technical climbing. When the climbs get a little steeper the Shimano Deore 10-speed drivetrain did leave us wanting for another lower gear but generally speaking it was fine whenever riding on dirt, and you can't really climb snow that's very steep anyway. All in all, the Farley climbs pretty darn well. It feels efficient and responsive on the climbs, surprising considering the massive rubber on this bike. The Farley 5 shares relatively similar geometry numbers with the other fully rigid bikes in this review. When compared to modern geometry numbers for trail mountain bikes they seem relatively conservative but they are pretty standard for fat bikes. The head tube angle of 69-degrees certainly sounds a little steep, but it is only a half degree steeper than the Wozo and a full degree steeper than the slackest models we tested, the Rocky Mountain Suzi-Q and the Salsa Beargrease. The fork on the Farley has been 100mm suspension corrected which helps make the front end of this bike a little taller and more comfortable than that on the Cannondale Fat CAAD 2. The seat tube angle of 74.4 degrees feels good and puts the rider right above the bottom bracket. The shorter reach measurement of 446mm feels good on this bike and helps keep you in a comfortable seated pedaling position. The wheelbase is also on the shorter side at 1143mm, almost 40mm shorter than the Wozo which has the longest wheelbase in the test. The chainstay length of 446mm is moderate in length but very reasonable considering the clearance needed for the 27.5" x 4.5" rubber on this bike. The rear dropout is adjustable and allows for 15mm of adjustment to accommodate for different sized tires or in case you wanted to set this bike up as a single speed. We also measured the Q-factor, the distance between the cranks, on the Farley at 180mm which is certainly on the wider side but we feel is quite respectable considering the rear tire clearance this bike has. Despite relatively conservative geometry numbers, the Farley 5 is quite capable on most terrain and situations. The Farley 5 is the least expensive model in this review, and by a fair margin, yet it has a component specification that is pretty comparable to its more expensive competition. The bike's skeleton is Trek's Alpha Platinum aluminum frame with a Bontrager Haru rigid fork with carbon lowers that has been 100mm suspension corrected. This suspension correction may seem insignificant, but it does help to raise the front end of this bike up a little bit, and the geometry won't change significantly if you were to purchase an aftermarket suspension fork. The frame has 2 water bottle mounts in the front triangle and has mounting options for a rack or other accessories on the seat stays of the rear triangle. The frame is also designed to accommodate an internally routed dropper seat post. The Farley's frame is nice and lightweight for the price with loads of clearance for massive tires. Trek's choice of a 10-speed Shimano Deore drivetrain is a little bit of a let down as we prefer 11 and 12-speed drivetrains these days, but it works just fine and offers pretty good range. This drivetrain setup includes a Shimano Deore derailleur and shifter, 11-42 tooth cassette, and Race Face Ride cranks with a 28 tooth chainring. Similar to the competition, Trek equipped the Farley 5 with SRAM Level hydraulic disc brakes and 160mm rotors front and rear. The basic Level brakes don't have much bling factor but testers found them to work well for the lower speeds associated with riding on the Farley 5. The 10-speed drivetrain was a low point of this build, but the Shimano Deore works reliably. In typical Trek bikes fashion, the Farley 5 is clad in a quite a few Bontrager, Trek's house brand, parts. This includes virtually all of the cockpit components like the 750mm wide alloy handlebar, 80mm stem, and the XR Trail Comp lock on grips. Our testers tend to prefer shorter stems and slightly wider handlebars, but 750mm isn't too far off the mark and will be wide enough for most riders. Trek also mounted a Bontrager Arvada saddle atop a basic alloy seat post that is held in place by a non-quick release seat post clamp. The saddle works just fine but isn't quite as comfortable as the WTB saddles found on some of the other models. We also prefer quick release seat post clamps on bikes with rigid seat posts to speed up changes in saddle height. The cockpit setup is relatively comfortable although the saddle was one of the least favorite of the bikes in the test. As with most fat bikes, the Farley 5 has SUNringle Mulefut rims. In this case, they are 80mm wide in a 27.5" size and are laced to a set of Bontrager hubs with 12 x 197mm rear and 15 x 150mm front axle spacing. We've read complaints online about the durability of these hubs but ours worked well throughout the course of our testing. Unlike all of the other fat bikes in this review, the Farley is mounted up with massive 4.5" Bontrager Gnarwhal tires. These tires are the widest of all the models we tested and they provide the best floatation and really impressive traction on both snow and dirt. Due to the girth of these tires, testers expected the Farley to roll slower and generally feel more sluggish side to side but that was not the case. The 15.5" and 17.5" frame sizes of this bike come with a 4.5" Bontrager Barbegazi rear tire. The Farley 5 in its factory build is best suited to snow or very soft surface riding. The massive 4.5" wide Gnarwhal tires are the girthiest of all the models in our test selection and provide the most floatation for use on soft surfaces like snow or sand. Those huge tires also have a meaty tread pattern and grip as well or better than the Maxxis Minion tires found on all of our other test models. Despite this bike's huge tires, it proved not to be a one trick pony and we were surprised by its mixed condition performance and capabilities on dirt and normal trail conditions as well. With limited accessory mounts on the frame and fork, the Farley 5 isn't as well equipped for bike packing or adventure riding as the Rocky Mountain Suzi-Q or the Salsa Beargrease. At a retail price of only $1,889, this is an incredible value for a reasonably lightweight fat bike that comes with a build similar to many of the somewhat more expensive models in this review. If you're in the market for a dedicated snow riding bike and you don't want to break the bank you can't go wrong with the Farley 5. This is hands down our Best Buy Award winner. The Farley is a blast excellent fat bike and great value, a shoe-in for our Best Buy Award. If you're looking for a less expensive fat bike to add to your quiver or an affordable entry-level model, we think the Farley 5 is very worthy of consideration. 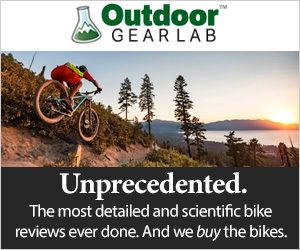 Its the least expensive model we tested and offers performance that is better than or equal to several of the more expensive bikes in this review. It's lightweight for the price, has a comfortable geometry, climbs and pedals efficiently, and it looks pretty good too. There's nothing earth-shattering about its performance, but it gets the job done and costs less than the competition. Trek makes several versions of the Farley fat bike from full carbon models to the affordable alloy Farley 5 model we tested. The Farley 9.8 ($5,150) is their top of the line model that comes with Trek's OCLV carbon frameset, carbon Bontrager Wampa wheels, carbon Stylo cranks, a SRAM GX Eagle 12-speed drivetrain, SRAM Guide RS brakes, and a Bontrager Line dropper seat post. The 17.5", size medium, complete bike is claimed to weigh only 27.1 pounds. The Farley 9.6 ($2,999) also features Trek's OCLV full carbon frameset, but comes with a SRAM NX Eagle 12-speed drivetrain, SRAM Level T brakes, and a smattering of house-brand Bontrager components. Trek makes one version of the Farley that comes with front suspension, the Farley 7 ($2,599). It comes with Trek's Alpha Aluminum frame and a Manitou Mastadon 34 fork with 80mm of travel. It is equipped with a Shimano SLX/XT 11-speed drivetrain, SRAM Level T brakes, and a dropper seat post.